Smart health involves applying electronic and computing technologies to the health sector by way of new medical diagnostic devices, personal wearable devices, health apps, and information management systems. Smart Health also leverages the new emerging areas of the “internet of things”, “machine learning” and “big data” and is therefore heavily engaged with new technologies. Globally the medical device market is growing rapidly due to new innovations, a growing middle class income group, and demand generated by illnesses associated with diseases of affluence and an ageing population. Increasingly medical devices and diagnostics are becoming focused on Theranostics and peronalised medicine as health practitioners strive to make more informed decisions around treatment and individuals take more responsibility for their health. There is also a desire to transition healthcare spending from drugs and therapy to preventive medicine; creating a demand for widely accessible new technologies. At VUW we have significant expertise in MRI technologies. One of our goals is to make MRI methods more accessible by lowering cost barriers and introducing AI to avoid the need for highly skilled operators. For lower socioeconomic communities having a low-cost device available at the local medical centre would offer significant benefit. Example applications include breast cancer risk screening and real-time monitoring of the brain oxygenation of stroke victims. Current research projects are in vision, hydration and ultrasound technology areas. Wellington is home to several engineering, design and medical research groups and a cluster of companies already developing and supplying technologies and products to the health sector. By building on our existing strengths we have the potential for a thriving, high-value, export industry sector that will provide many skilled employment opportunities. The smart health focus offers a unique opportunity to capitalize on Wellington’s existing capabilities while providing new benefits to society. Anyone suffering from muscular injuries is familiar with the dreariness of following through with their physio exercises at home. The Smart Interaction Design research lab at VUW has come up with a way to exercise in an entertaining and challenging way: the Swibo tilt board. 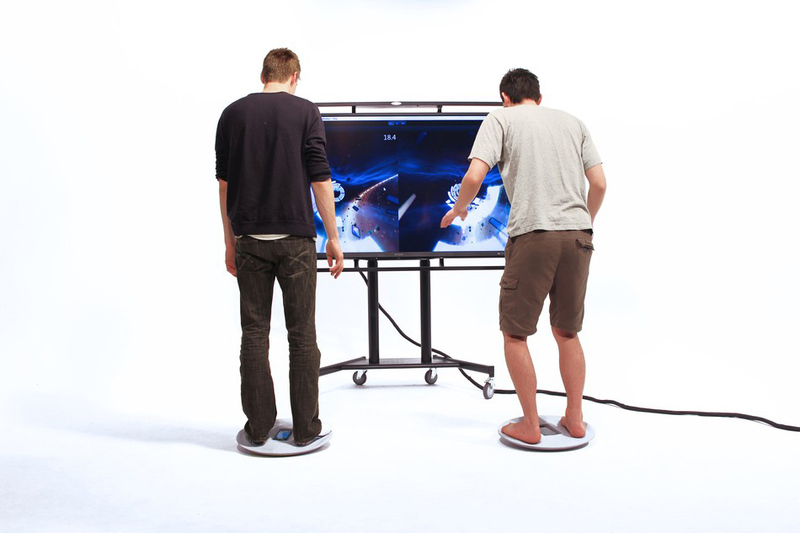 By developing software and specialized games and connecting your smartphone to the movement of the board, patients are encouraged to play competitive games, thereby exercising a range of muscles while having fun. Additional features enable not just the patient, but also their healthcare providers to keep track of the developments and provide more detailed feedback, improving the recovery experience overall. The system has been exhibited at the Interaction Design for Children Conference in Aarhus, Denmark 2014; CES, Vegas, USA 2016; Te Papa Wellington, New Zealand 2015; among others. Why would anyone ever want a urine volume dilution device? Everyone knows that urine concentration depends on our fluid intake and how much we excrete over a given period of time. Knowing this highly variable dilution factor (30 fold range), we can calculate the amount of other substances excreted, which in turn gives us a measure of their original concentration in the blood. Currently urine tests are only used in circumstances where we need to know IF, but not HOW MUCH of a specific substance is in the body. This limits the application of a non-invasive diagnostic tool, that can be collected easily at home or a medical centre. More accurate monitoring and assessment of the urine contents would reveal small fluctuations and enable more precise diagnosis. This could for example enable women to reliably manage their fertility discreetly. Pelvic floor muscle disorders (PFD) in women present a significant problem, both from an economic and patient perspective. Symptoms such as incontinence, pelvic organ prolapse, and pain are all strongly associated with pelvic floor muscle dysfunction. In collaboration with the Auckland Bioengineering Institute, the Smart Interactions Design team is designing a physical device and a mobile app that take into consideration the findings from mapping the experience of potential users, and address the issues of human experience including but not limited to privacy, intimacy and comfort, choice of materials, market segmentation, aesthetics, and manufacturing, all with the goal of helping women carry out their pelvic floor exercises. Collaborators: Edgar Rodriguez, Viv Baartman, Mailin Lemke, Kah Chan, Gillian McCarthy, Helen Andreae, Katie O’Brien, Holly Luxton-Russell, Evangeline Anastasia, Mahkaila Jones, Necaela Brown, Jenny Kruger, David Budgett, Poul Nielsen. Pupils provide important neurological information. A low cost, portable pupilometer has the potential to diagnose a wide range of conditions such as sleep disorders, life threatening aneurysms and different optic nerve diseases; as well as enhancing diagnostic decisions in new clinical settings such as ambulances and sports events. To meet this need the OpenPupil project proposes to use open source systems to allow ophthalmologists and other users to download and build their own OpenPupil headset. Online 3D printing platforms enable financially viable, one-off headset orders and all electronic components are easy to source and straightforward to install. A cloud-based data collection system (mobile app) creates a large biometric database and a cooperative user-generated research community. We are excited to see how open source technology democratises interesting new clinical science. Providing health care in remote or sparsely populated areas is often a difficult task. This applies to rural areas worldwide as well as military and humanitarian activities due to logistical issues. The mobility and reliability of equipment are vital in these areas. Sophisticated yet key diagnostic tools like an MRI are usually only found at major medical centres with large population bases. So far, developing a mobile MRI has not been of interest to large MRI manufacturers, as the financial returns are not likely to recoup the development costs. Research conducted by the Robinson Research Institute at VUW has led to developmental stage work on high-temperature superconductors for use in MRI applications. They do not require cooling equipment as do traditional superconductors and therefore have broader application. The Robinson Institute is currently collaborating with the School of Design to develop concepts for the user experience of this new technology and future applications. The Robinson Research Institute in the Faculty of Engineering at Victoria University of Wellington has been at the forefront of superconductor research for more than three decades. Responsible for developing the manufacturing processes that led to the first commercial-scale production of hightemperature superconductors (HTS), the Institute continues to develop the fundamental science of superconductors, increasingly focussing on applications of superconductivity, particularly large devices, which use superconductors. Globally, magnetic resonance imaging (MRI) manufacturers are the largest consumer of superconductors.Typically these systems use traditional low-temperature superconductors. To demonstrate the utility of high-temperature superconductors (HTS) for MRI, in partnership with NZ company HTS-110, we achieved a world first by manufacturing an MRI magnet from a 2 nd generation HTS conductor. Working with other NZ companies, we developed the complete MRI system on display here. Since development of this MRI system, we are working on an exciting new project led by the University of Minnesota (USA), utilising our expertise in HTS magnets and the VUW School of Design’s Smart Interactions Design research group, to develop a highly compact brain scanning MRI system. ‘Learning by doing’ is a great concept in theory, but especially when it comes to medical assessments, it’s good to know that the people helping us already know how to do their job. And even though New Zealand has ‘learning’ hospitals, when it comes to using sophisticated diagnostic tools like an MRI, knowledge on how to operate it is required to get consistent and reliable results. Terranova is the result of collaboration between VUW and Magritek (Wellington-based manufacturer of cryogen-free spectrometers). It is a portable teaching unit, which offers a hands-on learning experience of MRI and NMR techniques. The small scale and low cost maintenance make it ideal for teaching situations and any other practical applications where space is limited.